From the Rector On 3rd December I joined the local RC Deanery for the end of their meeting to plan for Christian Unity Week and I stayed on for lunch, as it was in the Priory. Our Christmas ‘season’ started off with the Christmas Sing Along on 30th November. It was a lovely evening with a great line up of entertainment, thank you to Ronnie Scott for co-ordinating the event. The Church was decorated on 14th December. Janet Edgely and her helpers did a wonderful job on decorating the Church for the festive season, a sincere ‘thank you’ to you all. On Sunday evening of the 16th we had our Nine Lessons and Carols service followed by refreshments in the hall. The Primary School Carol service was on the 18th and the Leinster singers had their annual Christmas concert in the church on 22nd. Everybody was in good Christmas spirits on Sunday 23rd for our family service. We had a great turn out, not least due the Good News Club nativity play which involved 26 children including 4 junior leaders! We had three services over Christmas, starting with our midnight Holy Communion, 8.30am Holy Communion with hymns and our Family Christmas Day Holy Communion Service at 11am which all went off well and with very good numbers in attendance. The 31st saw our annual New Year ’s Eve service at 11pm to welcome in the New Year. The service finishes just before midnight and it is a delightful way to welcome in the New Year. On 20th January for Christian Unity Week I went to St. Aidan’s, Brookfield Rd, where I preached on ‘the road to Emmaus’, Bill Mullaly from An Solas Methodist Church read the Gospel. Bishop Eamon Walsh presided. 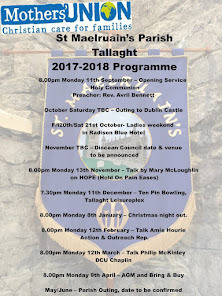 I thought it was interesting for the other ten RC parishes to go out to West Tallaght. God Bless, William. FESTIVAL OF HANDS. 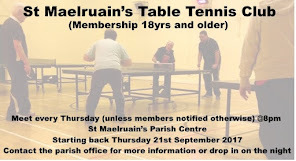 SEPTEMBER 27th - 29th ST. MAELRUAIN’S PARISH. For some time now, some members of the flower guild have been thinking about having a flower festival in St. Maelruains. For those who may not know, the flower guild is made up of a group of ladies that provide and arrange flowers for the church on a monthly basis. . Some parishioners provide flowers in memory of their loved ones on anniversaries. For the flower festival, we have engaged the help of florist Richard Haslam . Richard holds a National Diploma of the Society of Floristry and is a member of the American Institute of Floral Designers .He was a member of the Interflora gold medal winning teams at Chelsea and Hampton Court Flower Shows. 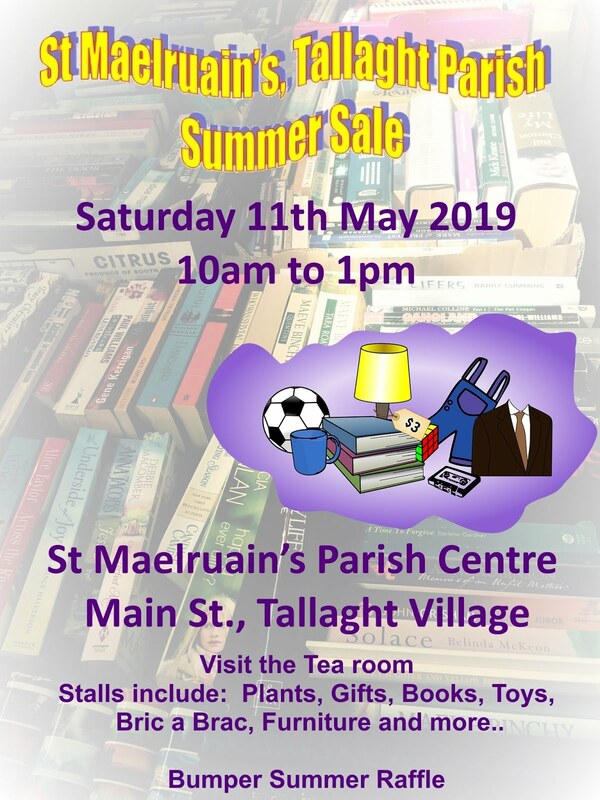 While we thought about the flower festival, our thoughts brought us to think about all the talent in our parish and in the wider community of Tallaght. If you are a visitor to the parish coffee morning, you will have sampled the delicious homemade scones, tray bakes, coffee and lemon cakes, to name but a few, all made by the volunteer team that runs that event. Wouldn’t it be nice to sit and have a tea or fresh coffee and sample these fine handmade goodies during the festival…………. 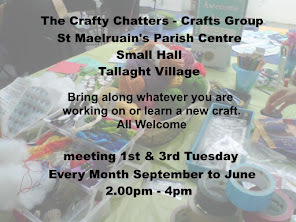 At the Crafty Chatters afternoon, you can see a group of women knitting and stitching the most beautiful handmade items. Fashionable hats, gloves and scarves are knitted along with baby cardigans, bootees and finest christening shawls. Items of crochet, patchwork, cross stitch and embroidery are all being created…..we should display them for all to see and demonstrate each craft…..
What about all our friends who paint . Wouldn’t it be nice to see their work and hear their story about the various masterpieces painted with watercolour, acrylic or oil……. Then there are the people that turn out beautiful wood turned items and handmade wooden items. Have you seen a wood turner turn wood on a lathe? Have you played whist? Would you like to see how it’s played? Do you or your children ever make jigsaws? Let’s make one together! All the above along with more will make our Festival of Hands on September 27th to 29th. We hope to open with a concert in the church on Thursday 26th and close with a service on Sunday 29th at 5.00 pm. We are hoping that the Archbishop will attend if he is not already booked for that date. Will you join us to help make this event a success? We need people right now, to help in all areas such as fundraising, advertising, catering, security, general help that whole week end. BAPTISMS On 1st December we had the baptism of Siennita, baby daughter of Sonja Glass and Miguel Angel Vasquez Rengifo and on the 2nd Olivia, baby daughter of John and Jenny McDermott was also baptised. On the 15th December the baptism of Saoirse Wamui daughter of Lucy Nzeyimana and Victor Haji took place and on Sunday 6th January we had the baptism of Toby Gibney, baby son of Niall and Sandra. Please pray for both these children and their families as they begin their Christian lives. CONDOLENCES The funeral of Reg Deegan, Kilnamanagh, took place in his home parish of St. Mary’s, Crumlin on 28th November. We express our sincere sympathy to his children; Sarah, Naomi, Deborah and Philip and to his grandchildren Amy and Michael. We also express our sincere sympathy to our Rector, William and to Valerie, Amy, Lionel and to the rest of their family on the death of William’s Mum, Phyllis. The funeral took place in Monkstown Parish Church on 31st January. ANNIVERSARY Our thoughts and prayers are with Lydia Oropo, her children Dimeje and Michelle as they remembered Alfred on Sunday 13th January in Church, the 3rd anniversary of his tragic death in Nigeria. The next Whist Drive will take place on Monday 18th February at 8.00pm in the Small Hall, all welcome! SCHOOL NEWS The Archbishop of Dublin and Glendalough Rev. Michael Jackson visited the school on the 6th December to mark the 30th anniversary of the school. A tree was planted in the courtyard and a plaque was unveiled to mark his visit to the school. He called into every class room and thoroughly enjoyed chatting to the children. We had our PTA meeting on 8th January and we have a new committee for 2013. The new committee will meet again on 11th February to set out how they will work for the good of the school community during the coming year. The Board of Management have decided that all fundraising for the coming year will go towards the cost of extending the infant playground. We will be bag packing in Dunnes Stores in City West on Fri. 22nd and Sat. 23rd February. Ms. Rountree is planning to register for the Flora Mini – Marathon in June, also to raise money for the playground. Ms Ann Mulligan joined the staff as a SNA in December and we said good bye to our part time resource teacher Ms. Suzanne James also in December and are now delighted to welcome Ms Sarah Fleming two days a week. COFIRMATION CLASSES Confirmation classes will be starting shortly, if you are interested in confirmation, please contact the Rector as soon as possible. There will be a pre confirmation day in the Memorial Hall, Rathfarnham Rd. Terenure (at the junction of Bushy Park Rd.) on Saturday 9th February, again, contact the Rector for further details. MOTHER’S UNION On Monday 14th January, we greatly enjoyed our New Year Dinner in the Blazin Grill Tallaght. 8pm Monday 11th February 2013: We will have a talk by Barnardos on “Working in the Community” and at 8pm on Monday 11thMarch our meeting will be on Guide Dogs for the Blind. TEA LADIES FEBRUARY: Iris Harley & Noelle Lewis. SAOIRSE: Hair brushes required as February donation. Please spread the word about these two very interesting meetings – we will be delighted to welcome anyone interested. 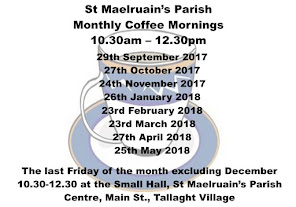 PARISH COFFEE MORNING We resume our Coffee Mornings on Friday, 22nd February, 10am – 12.00 midday, in the Old Hall. We look forward to seeing everyone back again, and hopefully some new faces too. Be there, or be square! !